Molding Corporation of America (MCA) works tirelessly at improving quality and operating efficiency through employee training and participation, information systems, advanced molding technologies and statistical process control and monitoring. We're committed to meeting and exceeding industry standards using the most sophisticated engineering and specialty materials. We rely on rigorous Q/A training programs for our employees. 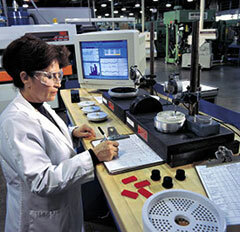 We monitor our products and process through our well staffed Q/A laboratory. Starting with the customer, we fully define the agreed upon requirements which we document and monitor throughout the process. Our quality laboratory features a full range of measurement equipment including digital calipers and micrometers for direct electronic data entry, analysis and reporting. Laboratory support equipment includes; color measurement equipment, a 30-inch optical comparator, microscopes and precision equipment for the measurement of impact resistance, hardness, flatness and concentricity. We assure uniform dimensional accuracy, structural integrity and cosmetic consistency in all finished parts and assemblies—so you can depend on them to perform reliably as intended. Do's and dont's of part design.